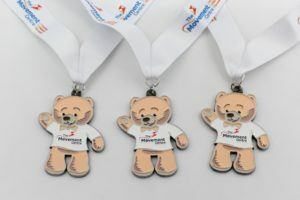 The Movement Centre has an exciting running event that will run through the month of April, and participants could get their hands on a fantastic medal. We have teamed up with Masters of Brands and want people to join us this April for Monty’s Virtual Running. Those taking part can run, jog, or walk 5k to receive a bespoke Monty Medal. 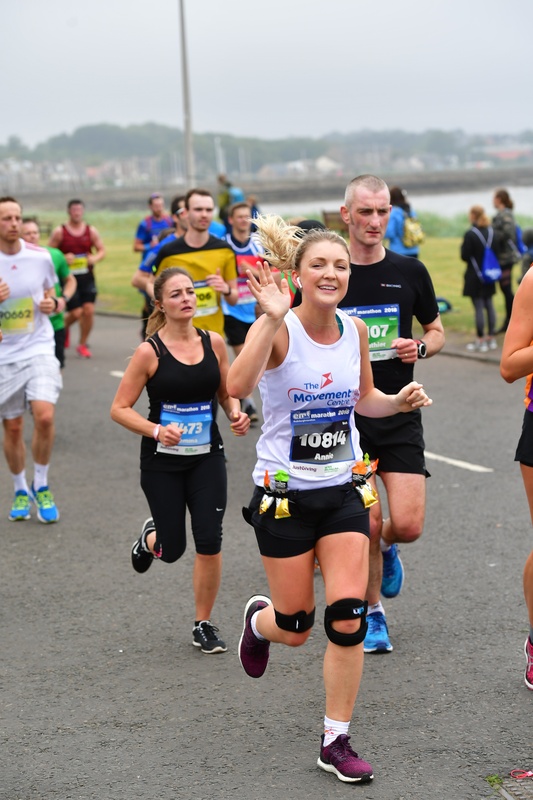 Virtual running works exactly the same as any other type of running event but the difference is that a virtual race can be run at any location, at any pace, inside on a treadmill or outside on road or trail. To enter the challenge runners must provide evidence that they have completed 5k by sending The Movement Centre a screenshot of their activity. This can be done with a picture of their activity watch or screenshot of a phone running app. That’s it! We will then deliver a special ‘Monty Medal’. 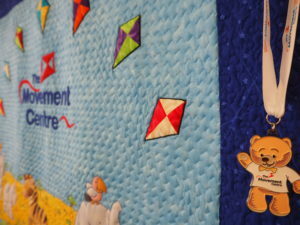 The Movement Centre is a charity providing a specialist therapy for children, called Targeted Training. 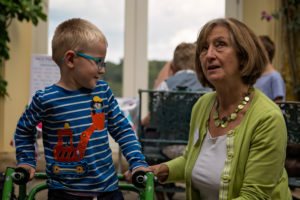 The children who come to The Movement Centre have a disability that affects their movement control, such as Cerebral Palsy, Down Syndrome or Global Developmental Delay. This means they may be unable to lift their head, to sit without support or find it challenging to stand or take their first steps. We would love people to join us for our first virtual run. 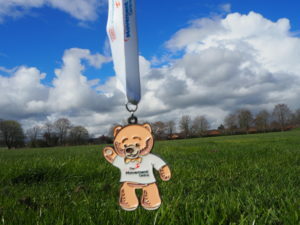 Runners will get some extra special medal bling while supporting a local charity. Running or visit our Facebook page. 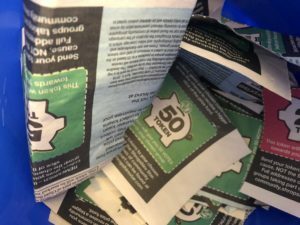 Once participants have completed their 5k run, jog or walk they must send proof of completion and address to [email protected] to receive a very special medal. Last week was sadly a week of goodbyes at TMC. We also said farewell to our Chair of Trustees, Julia James. Julia has been on the Board of Trustees at The Movement Centre since 2006 and was the Chair for the last 2 and a half years. All of our trustees offer their time on a voluntary basis and we can’t thank them enough! Julia (a retired physiotherapist who had a private practice in Wrexham) has supported TMC in so many ways over the last 13 years. We will all miss Julia very much and wish her all the very best for her retirement! David Vicary will be taking over as the new Chair of the Board of Trustees at TMC. We have also recently been joined by new Board members Anita Roberts, Alison Shields, Dave Williams and Katrina Graham. We will update you on our new Board members soon! Today we have some sad news to share with you all. Last week we said goodbye to Pauline Holbrook (Physiotherapist and Head of Clinical Services at TMC) who is retiring. Pauline has been at TMC since 2012 and has worked with so many children and their families over the last 6 or so years, making a huge impact on their lives. She will be sadly missed by so many people, not least by all of the team at TMC. We wish her all the very best for the future. She has lots of exciting trips planned already. We are all very jealous! We will be keeping in touch with Pauline so we know it’s not really goodbye, but instead ‘see you soon’! Patrick was attending The Movement Centre for his latest review yesterday, and he had some special visitors from Shrewsbury Town. James Bolton, Shaun Whalley and Oliver Norburn visited The Movement Centre to find out a little more about what we do, and meet some of the children that attend. They had a good chat with Patrick about football, as he is a Manchester City fan. Patrick also wanted to know what cars they have (a question he asks everyone he meets). We cant thank Shrewsbury Town in the Community enough for arranging the visit, and thank you to the players for taking time out of their busy schedule to visit. Good luck to the team for the rest of the season. 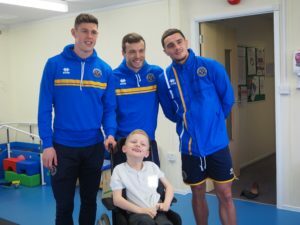 The Movement Centre are in talks with Shrewsbury Town in the Community to deliver some training to some of their coaches, that deliver their disability football sessions. We look forward to working with them. The Movement Centre are one of the lucky groups to have been accepted for the Cash For Your Community 2019 campaign. 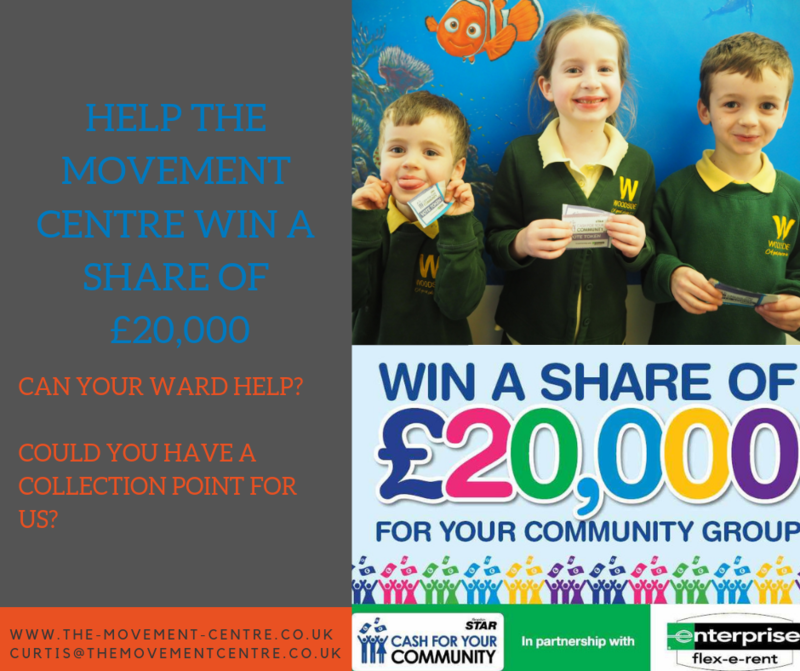 CFYC is a campaign run by Shropshire Star and Enterprise Flex- Rent. Address: The Movement Centre, Building 106, RJAH Orthopaedic Hospital, Gobowen, SY10 7AG. Alternatively you can email [email protected] and we can arrange to collect the tokens from you. Centre within the last 12 months. We have had lots of women complete challenges for us in the last 12 months which include Anna (joined by her husband) completing the Three peaks challenge, Annie running Edinburgh Marathon, and Kelly throwing herself out of a plane! Elan Catrin Parry joined us for an evening of song when she performed with the Rhos Orpheus Male Choir in Oswestry, while one of our volunteers, Doreen made the climb up to the summit of Snowdon. 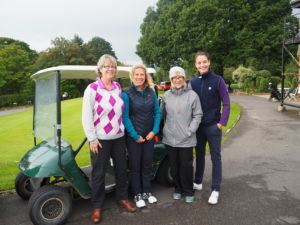 She was joined by Sarah (one of our Physiotherapists), Viv, Nikki and Lynne. 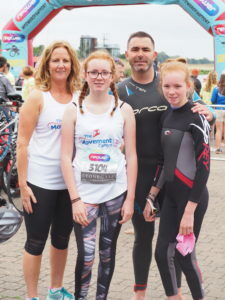 Lydia, Maddison and Mum, Jo (joined by Dad, Darren) took part in Superhero Series last August, and really enjoyed the day. They joined our patron Sophie Christiansen CBE at the all inclusive triathlon down at Dorney Lake. Finally the ladies from Lanyon Bowdler joined a field of golfers at our annual Charity Golf Day at Arscott Golf Club. These are just a handful of the great women that have supported us this year (sorry if we missed you). Thank you to you all, and we hope you continue to support The Movement Centre, have a great day! At Christmas, The Movement Centre were asked to support a local rotary group on the Santa sleigh tour. We had a team of 9 who joined some rotary members to walk around the streets of Oswestry, where families could come out and see Santa on his sleigh. We had great fun, and seeing the children’s faces as Santa flew by on his sleigh, it was a picture. Oswestry Cambrian Rotary provide Santa and Sleigh for the annual Christmas Parade in Oswestry on the first Saturday in December. Then they collect money around the streets of Oswestry and surrounding villages up to Christmas eve. Money collected is distributed to local charities and organisations and other charities supported by Rotary. 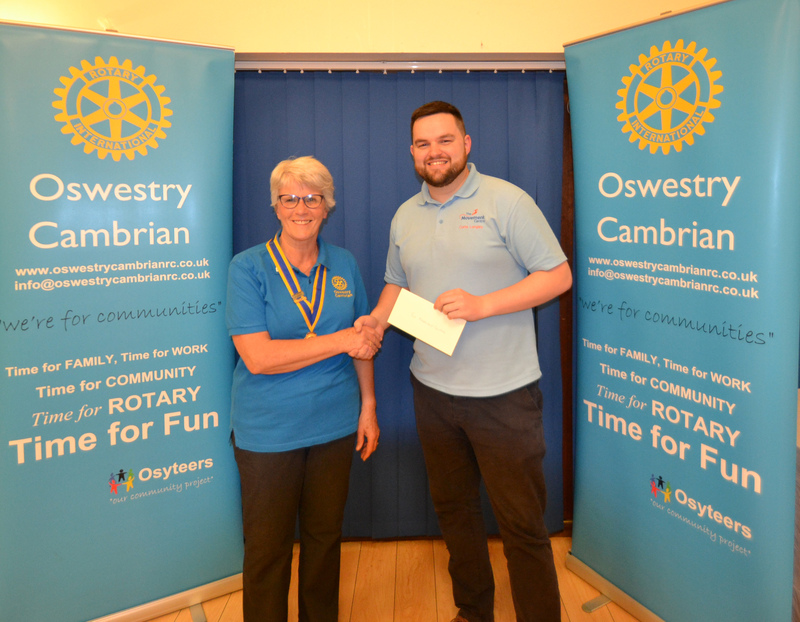 Curtis, Fundraising and Marketing Officer from The Movement Centre went along to the cheque presentation at Oswestry Cricket Club. It was a great evening where over 10 charities collected a share of the donations. We can’t thank the rotary club enough. New year resolutions are something everyone does. Some people start running, some give up chocolate, others set themselves a challenge. The normal challenges people set themselves are marathons, triathlons, eating challenges, giving up challenges, but this challenge is something new. 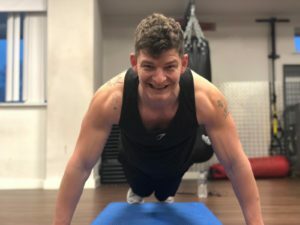 Kyle Worrall, of Shrewsbury has set himself the challenge of completing 5,000 Press-Ups or more within an allotted time, and all in the name of charity. Kyle works as a care assistant and fitness instructor in Shrewsbury, and wanted to use his fitness background to complete this fitness challenge. Kyle said “I wanted to do a challenge that seemed impossible, to prove to myself and others that you can accomplish more than you think”. He then continued “I wanted to do this challenge for charity and chose The Movement Centre because they give children a shot at a better quality of life. The Movement Centre teaches them that they can achieve more than what others think they can, and this is something that I value a lot”. 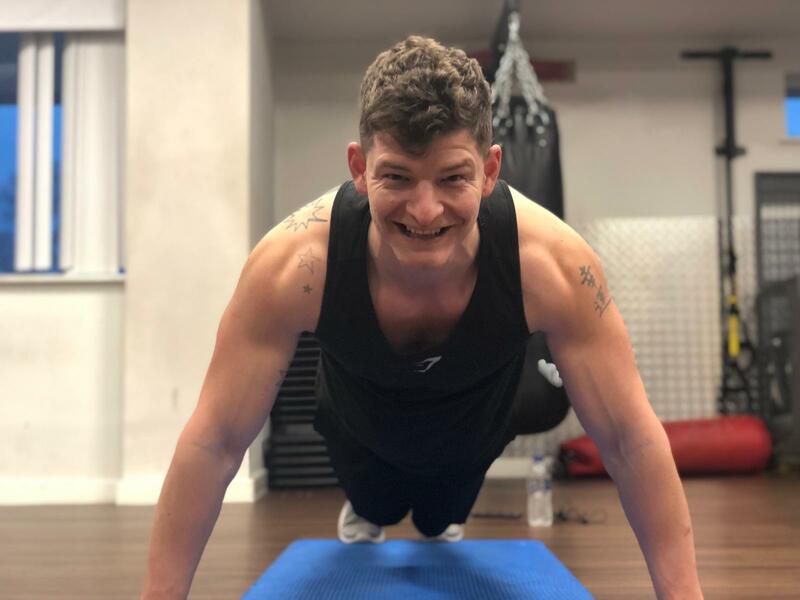 This 12 hour push up challenge will take place on 22nd February at Anytime Fitness in Shrewsbury and Kyle is inviting any fitness fanatics to join him in his fundraising, and join him for an hour of press ups. If you would like to join Kyle then get in touch with The Movement Centre. 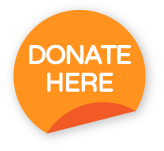 After visiting The Movement Centre, and learning more about the work they do, Kyle wanted to raise enough money to cover half a course of therapy for one child. Kyle would like to invite anyone wanting to sponsor him to complete this challenge to donate through his JustGiving page https://www.justgiving.com/fundraising/kyle-worrall, or sponsorship forms at Anytime Fitness Gym. Jo, Maddison, Darren and Lydia. Our superheroes!! A Shropshire family have raised over £2000 by taking part in a unique challenge to raise funds for a Shropshire charity as part of the Superhero Series. The Superhero Series is the UK’s one and only disability sports series for the Everyday Superhero. The idea is simple: To create fun, full-throttle challenges where people with disabilities call the shots and don’t have to worry about cut-off times or equipment restrictions. Firstly, Darren and Lydia took on the swim in the cold Dorney Lake. Lydia has cerebral palsy and even though she is well practised in the cold water of a leisure pool, swimming in open water was a massive challenge for her, but one she was determined to complete. Once Darren and Lydia had completed the swim, they then got onto a bike to complete another leg of the triathlon. They were given a bike to use on the day by Quest 88, which worked in the same way as a tandem bike. Dad and daughter cycled and laughed their way around the course with ease, and then handed over to Mum and Maddison to complete the third leg of the race. Team Griffiths raised £1,142 for The Movement Centre, and had their fundraising efforts recognised by NatWest, where Jo works. The money was raised by the family along with Jo’s colleagues at NatWest in Oswestry, through Cake sales, a sponsored walk. NatWest match funded their fundraising with a donation £1000. This brought the total to an incredible £2142. Well Done Team Griffiths!! 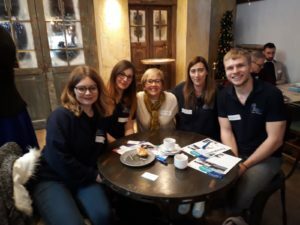 Pauline Holbrook, The Movement Centre’s Head of Clinical Services, attended Lanyon Bowdler’s Brain Injury Networking Forum in Shrewsbury on 22nd November, which gives attendees the opportunity to coin the the discussions from their hugely successful conference ‘Surviving Brain Injury: The Journey’. It is a great opportunity to meet with other individuals and organisations. Pauline is pictured with representatives from Megan Baker House who were able to share more details about their services. We believe it is very important for TMC to develop links with other organisations in our field and we are always happy to sign post families. Megan Baker House (MBH) is a registered charity that provides on-going services for children and adults of all ages with neurological movement disorders (such as cerebral palsy, dyspraxia, Parkinson’s’, stroke and brain injury) using the methods of conductive education. This is an educational movement approach that teaches individuals how to manage and deal with the difficulties and challenges caused by their condition, and to promote their independence and confidence. 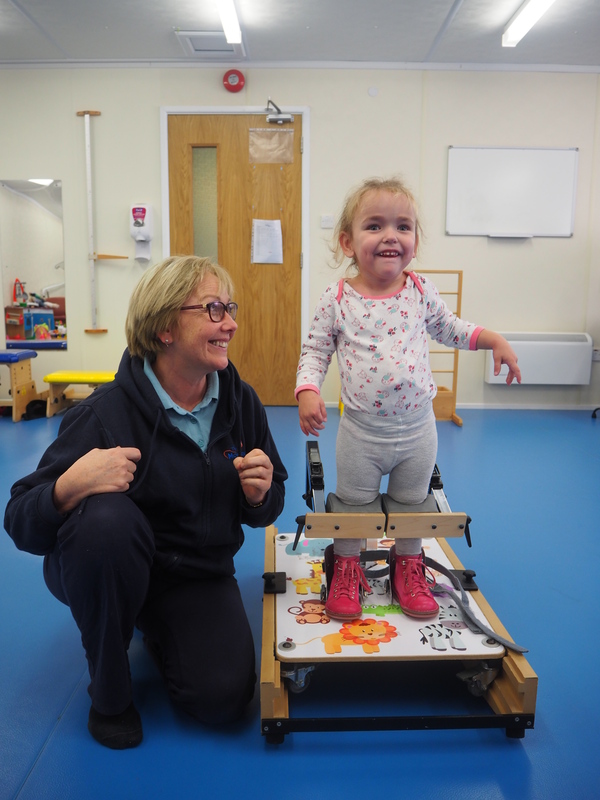 MBH offer regular small group sessions at both centres where individuals will work on all aspects of movement, alongside cognitive skills, social skills, self-care, speech and writing. At the new Ledbury centre, MBH is offering additional, specific speech and writing sessions, taking place once a month, for individuals with Parkinson’s. For more information please visit their website:www.meganbakerhouse.org.uk, or to book in for a free consultation, please contact them directly via email: [email protected].